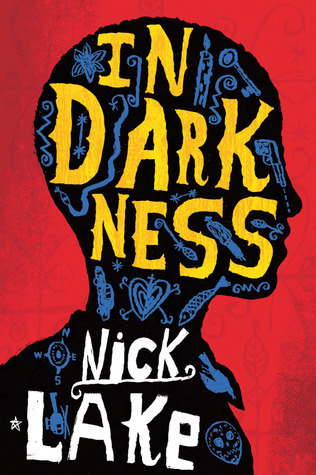 In Darkness by Nick Lake was the recipient of the 2013 Prinz Award, which recognizes exceptional YA literature. Lake weaves together two stories, one set during the 2010 Haiti earthquake, and the other following the earlier history of Haiti in the late 1700s and told though Toissaint L’Ouverture. When the earthquake hits Haiti, Shorty finds himself trapped in the very hospital he went to for treatment of a gunshot to the arm. He doesn’t know for certain what event triggered the collapse of the hospital, he only knows that he has been left in complete darkness with no way to get out. At first, there is no real linking of Shorty’s and L’Ouverture’s stories. In the first few hundred pages or so, their stories rotate with one another, and the reader is taken back and forth between “Then” and “Now.” This travel between the 18th and 21st centuries is not at all as jarring as it could be. Instead, the Haiti setting holds both experiences together, even though so much time exists between them. L’Ouverture’s story begins when he is fifty-four years old, as he becomes the leader of the Haitian Revolution, leading the population of slaves towards the goal of becoming a self-governing free people. In Darkness could easily replace a book such as Uncle Tom’s Cabin in high school classrooms, because although the setting is changed from the US to Haiti, the horrors of slavery are just as present here, alongside the recent context of the 2010 earthquake in Haiti. Shorty’s story begins in the darkness of the collapsed hospital, however, he backtracks while trapped to tell the reader where he came from. He speaks primarily about the horrors of his own life in the Site Soley where two gangs – Route 9 and Boston – shape much of his everyday life. Their lives weave together in an interesting way, and it is worth reading through to the end to watch the two individuals’ lives, separated by much time, if not distance, overlap. In Darkness is exceptionally written, and uses a mix of English, French, Kreyol, historical context, and pop culture to bring Haiti to life for readers. There is more to this book than the two stories it tells. Instead, In Darkness focuses on bringing a country to life for readers who may be unfamiliar with it. Historical and contemporary contexts bring these separate events together in a way that no other work can.